Dragongate: Amazon Adventure # 3. Launching Amazon. Raising the mast on the Alafia River. We had arrived in Plant City near Tampa Bay on the west coast of Florida for two reasons: this was where my cousin Bob lived, and he and Shirley were to be important facilitators of the transition from trailer haulers to sailors, and because we felt that from here we could go down the coast and across Florida in protected waterways while we adjusted to our new boat and way of life. The periods of new adjustments just kept on coming! While Heather and the girls caught up on their schoolwork and adapted to the heat, humidity and cockroaches, Bob and I scouted for a launch site and shopped for boat supplies and charts. After a few days, we launched Amazon in a community Park on a river and left the car and trailer with Bob to care for over the next few months. We were now car-less in Tampa Bay and into the next phase of our adventure. The weather had now broken, the hurricane season was over and the winter ‘Northers’( strong, northerly winds reaching down from cold fronts further north) had started. We attracted lots of attention at the park on a wet windy launching day while we put our rig together, hoisted the mast and installed the galley boxes on the foredeck. Everything had to be onboard by nightfall and Amazon anchored safely well off the beach as this area was a winter retreat for poor ragged folks who chose ( like many Canadians) to spend the winter in a warm place. We were distinctly aware of our vulnerability and this was reinforced by a Marine Patrol officer who visited us regularly and said that without a gun, we would never get out of Tampa Bay, never mind the rest of Florida and (God forbid) the Bahamas! 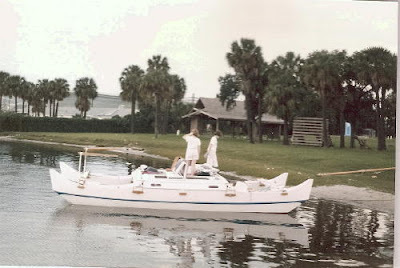 One morning, after being sized up by a shady character in a car we decided to ‘test the outboard’on a short run down river and then kept going down the coast of Tampa Bay until we found a sheltered bay in a day use park. 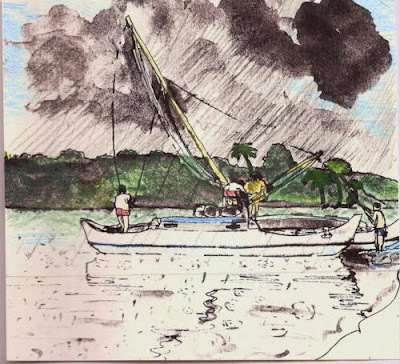 Here we anchored for a couple of days as we rigged the trampolines fore and aft between the hulls, completed and hoisted the tent, sheltered from another Norther and watched the manatees feeding all around us. The Park Rangers were none too happy at first to have us stay overnight but finally allowed ‘ a fellow ranger from Canada’ to anchor off the land portion by night and to come ashore and use the showers during the day. We found that generally our family adventure attracted a lot of fellow feeling from many people who dreamed of stepping out of the ruts they had dug themselves into and could almost imagine themselves in our shoes. Launching day! At a public launching ramp on the Alafia River. Found a crew of people ( bums and boaters) to help push her off the trailer. Big push! Nothing. Out with the mazola oil to grease the ways. Big push! Zoooom!!!! Nearly burned my hands on the tether rope trying to stop her from bumping another boat coming in. Even still strapped together, she looked good floating high and wet for the first time. Then over to a beach to spread the hulls and assemble the big cross beams and central platform. What a hassle, but finally semi and quickly assembled in the pouring rain (warm) We then threw everything aboard and anchored beside the ‘Warning! Manatee.’ sign. Doing the final adjustments to the rope lashings for the cross beams. Raising the mast, instruction book in hand. A long string of visitors with horror stories of pirates and storms. That evening aboard, it poured with rain as we celebrated Heather`s birthday so we were all under an orange tarp eating our turkey soup and bananas and custard. We lit the birthday cake candles and sang Happy Birthday. Later in the night I was up setting a second anchor in the wind and then slept intermittently rolled up in the tarp. Heather was down below keeping dry scrunched up in the head compartment. A birthday to remember ( or forget!). As we motored down the river we saw our first alligator (10feet long). Once in Tampa Bay it was quite choppy. Splash, splash! Out in the shipping channel. We are navigating by road map. We passed a couple of barges and tugs and saw our first porpoises. Girls emerged from their hulls slightly green but recovered. We overshot Apollo Beach by a couple of miles but found a state park. We are anchored at last in a lagoon at sunset. Pelicans splashing down after fish. Alligators watching. We put the tent up for the first time. A really beautiful place. Anchored fore and aft and watching the sunset through the palms. Now this is more like it! Bill. Pitched the tent for supper but the wind came out in force and we lay in bed (on deck) and watched it flap, until at 11:30 we upped, and downed the tent in a thrashing gale. The rest of the night was a bit chilly as Bill kept hopping out of our tarp to check things. Here`s hoping the wind is with us tomorrow so we can scoot south! Heather. Have we spent the night in the mangroves yet? I remember the horrible mosquitos that were everywhere. We lit those stinky coils to get rid of the mosquitos and for the rest of the trip, the tent stunk a bit. No, not yet. That comes in L Okeechobee. Funny, the things we remember hey?